Three artists. Three colleagues. Three friends. One exibition. Ruth le Cheminant, Ingrid Russell and Vicki Hersey. Three Blue Mountain artists. Three colleagues. 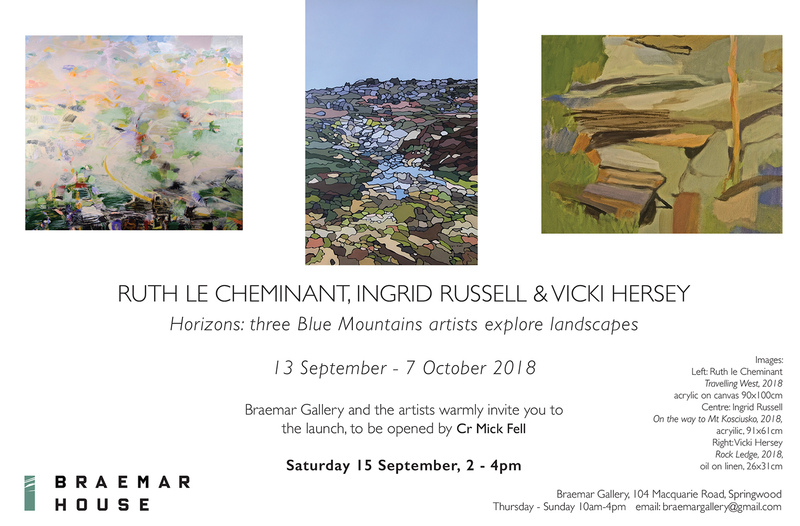 Three friends got together – over quite a few cups of coffee – and together presented a proposal to Braemar Gallery for a joint exhibition and called our exhibition Horizons. We all agreed one common factor in a landscape is the horizon. It is a reference point to our world. Above the horizon is sky and below is the land. Some artists paint completely below the horizon line, some a mix of both a some just the sky. We present the viewer three very different interpretations of the landscape.